The Nerf N-Strike Elite Strongarm is one of the top Secondary (or Sidearm) Nerf blasters. It’s actually one of the best-selling and highest rated Nerf Guns in existence. A main reason is a new feature called the “Slam Fire Slide”, which is a unique addition to the Strongarm. With an Elite blaster, you can shoot your darts and maintain proper aim and stability because the new Elite blasters come with a new kind of technology which makes handling your Nerf blaster easier and more comfortable. The Elite Strongarm makes it easy to reload with the the auto-rotating barrel which flips open easily when we need fast reloading under fire. 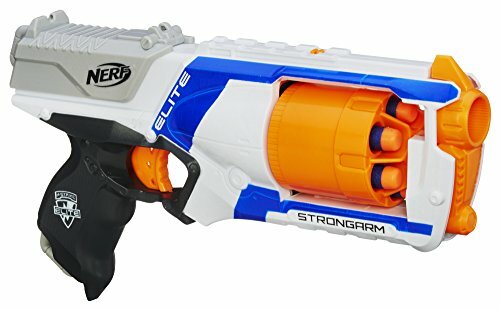 Hint: click or tap the stars for the most helpful Nerf Strongarm (N-Strike Elite) Amazon reviews. Nerf Strongarm (N-Strike Elite) mod kit & step-by-step guide coming (very) soon. Click here to be the first to know when it's ready! Nerf Strongarm (N-Strike Elite) range test coming soon! Get the Strongarm (N-Strike Elite) Mod Guide!